"AINHOA" NO PUEDE EMPEZAR MEJOR ESTE 2018. 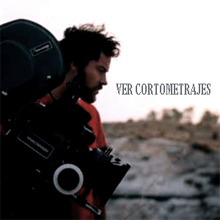 !PREMIO AL "MEJOR CORTOMETRAJE" EN EL "BARCELONA PLANET FILM FESTIVAL"! -! "AINHOA" PREMIO "MEJOR CORTOMETRAJE" en el "Barcelona Planet Film Festival 2018"! 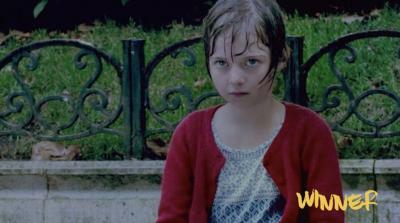 "Ainhoa" suma ya 21 Premios Internacionales. !Muchas felicidades a todos! -WINNER "AINHOA - Short Film" by Ivan Sainz-Pardo has won the "BEST NARRATIVE SHORT AWARD" at "Barcelona Planet Film Festival 2018". SPAIN! 12/01/2018 14:25. Ivan Enlazarme. PROYECTOS No hay comentarios. Comentar. 16/01/2018 14:12. Ivan Enlazarme. PROYECTOS No hay comentarios. Comentar.
! "AINHOA" COSECHA 3 PREMIOS EN LOS "SFAAF AWARDS" DE CHILE! -! "AINHOA" recibe 3 premios: "PREMIO DEL PÚBLICO" , "MEJOR ACTRIZ (Aurelia Schikarski Angela Schikarski) y MEJOR ACTOR SECUNDARIO (Fele Martinez) en el "The South Film and Arts Academy Festival". CHILE! 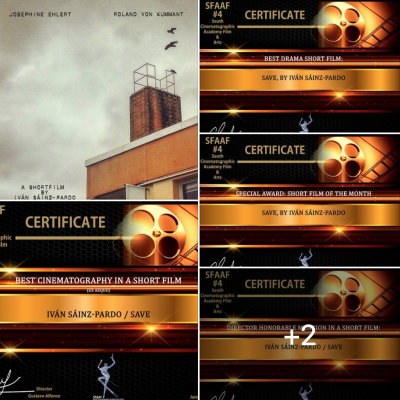 -WINNER "AINHOA" - Short Film" by Ivan Sainz-Pardo has won 3 AWARDS: "FIRST AUDIENCE AWARD", "BEST YOUNG ACTRESS (Aurelia Schikarski) and BEST SUPPORTING ACTOR (Fele Martinez) at "The South Film and Arts Academy Festival". CHILE! 21/01/2018 21:36. Ivan Enlazarme. PROYECTOS No hay comentarios. Comentar. 21/01/2018 21:39. Ivan Enlazarme. PROYECTOS No hay comentarios. Comentar. 21/01/2018 21:40. Ivan Enlazarme. PROYECTOS No hay comentarios. Comentar.
! "AINHOA" VENCE CON 4 PREMIOS EN EL "REDLINE INTERNATIONAL FIM FESTIVAL" DE TORONTO! -! 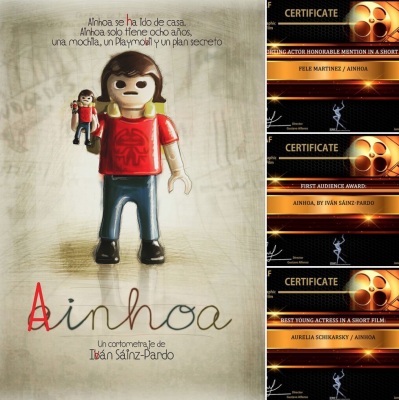 "AINHOA" recibe 4 premios: "MEJOR CORTO DE FICCIÓN", "PREMIO ESPECIAL DEL DEL JURADO" (Exequo con The Good Fight de Ben Holman), "MEJOR ACTRIZ SECUNDARIA (Natalia Mateo)" y "MEJOR ACTOR SECUNDARIO (Fele Martinez)" en el "Redline International Film Festival ". Toronto. CANADA! -WINNER "AINHOA" - Short Film" by Ivan Sainz-Pardo has won 4 AWARDS: "BEST FICTION SHORT", "JURY'S CHOICE | BEST SHORT FILM" (Exequo The Good Fight de Ben Holman), "BEST SUPPORTING ACTRESS (Natalia Mateo) and "BEST SUPPORTING ACTOR (Fele Martinez)" at "Redline International Film Festival ". Toronto. CANADA! 25/01/2018 23:20. Ivan Enlazarme. PROYECTOS Hay 1 comentario. 29/01/2018 13:49. Ivan Enlazarme. PROYECTOS No hay comentarios. Comentar.
! "SAVE" PREMIADO AL MEJOR CORTOMETRAJE DE TERROR EN PUERTO RICO! -! 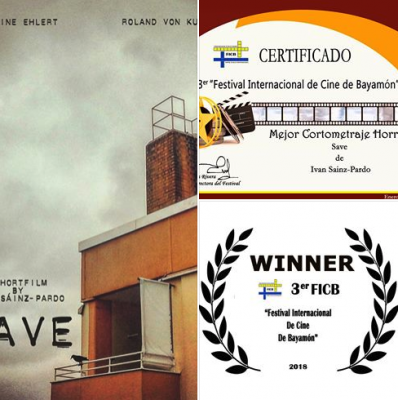 "SAVE" ha recibido el Premio al Mejor Cortometraje de Terror en el "BAYAMÓN INTERNATIONAL FILM FESTIVAL 2018". PUERTO RICO! 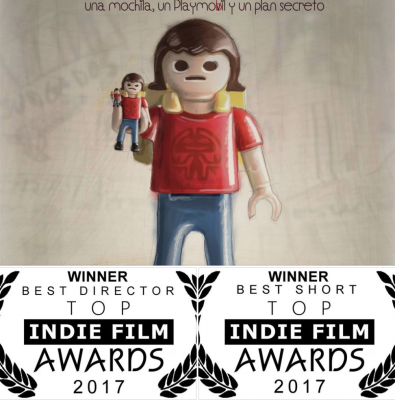 -WINNER "SAVE"" - Short Film" by Ivan Sáinz-Pardo has won BEST HORROR AWARD at "BAYAMÓN INTERNATIONAL FILM FESTIVAL 2018". PUERTO RICO! 31/01/2018 22:24. Ivan Enlazarme. PROYECTOS No hay comentarios. Comentar.